NAPLES, Italy (AP) — Napoli fans and players showed their support for defender Kalidou Koulibaly in Saturday’s 3-2 victory against visiting Bologna in Serie A after he was subjected to racist chants this week. With Koulibaly suspended, Napoli fullback Faouzi Ghoulam warmed up wearing the Senegal international’s No. 26 shirt. 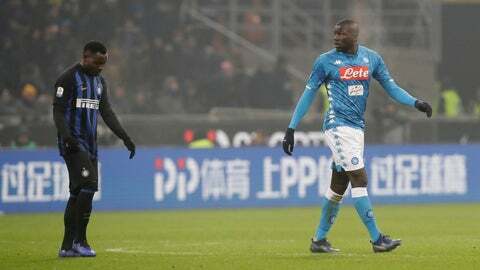 Koulibaly had monkey noises directed at him throughout a match against Inter Milan on Wednesday at the San Siro Stadium. He was sent off after receiving two yellow cards in quick succession late in the match, the second for sarcastically applauding the referee after being shown the first. Koulibaly was then suspended for two matches — one for the red card and one for applauding the referee. After the Inter game, Napoli coach Carlo Ancelotti threatened to lead his team off the field the next time one of his players is subjected to continued racist abuse. Napoli beat Bologna thanks to a late winner from Dries Mertens.